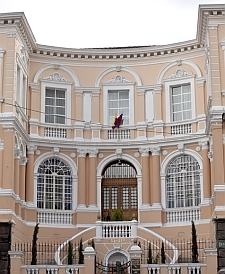 The historic district of Quito was the first place in the world to be designated a UNESCO World Heritage site. Instead of a few hours on a walking tour or (shudder) a quick bus tour, stay in one of the hotels with character in the capital instead. As with Lima to the south, Quito, Ecuador is often a way station for vacationers on their way to somewhere else—in this case the Galapagos Islands. Many travelers spend just a night in Quito on the way in or out, or skip it altogether and go through Guayaquil on the coast. That’s a shame because this city has the largest historic center by area in South America and it’s an atmospheric place meant for lingering. Here are the top choices for hotels in Old Quito. From the sumptuous rooms to the excellent upscale Ecuadorian restaurant, everything is done right here and the amount of public space available makes it feel like a much bigger hotel. Service from the bilingual staff is superb. Just a few blocks from the main plaza, it’s easy walking distance to local attractions. Rates start at $418 with breakfast, but there are often packages running if you’ve got more than a night to spend. See the Gangotena website for more, book online with Hotels.com, or see this detailed review of Casa Gangotena Hotel. Before Gangotena opened, this was the top luxury hotel in town and it’s still a prime choice for its luxurious rooms and envious position a stone’s throw from where the country’s president works, on the main plaza in the center. When you walk out the door, you’re right in the thick of things. With only 15 rooms, it’s not hard for staffers to remember your face and name. The ground-floor restaurant here is a favorite lunch spot for local power brokers and tourists alike and it’s a good place to try traditional Andean food and great desserts while musicians stroll by playing. Upstairs there’s another restaurant and intimate bar. Rates officially start at $415 a night, but in slow periods you see promotional rates for less. See the English version of the website (not as pretty as the Spanish one unfortunately), book online, or get more info from this Plaza Grande Quito review. If you want to be in the heart of the old city but the rates at the first two give you a heart attack, Patio Andaluz is a good compromise. Here you can usually get a room for under $200 and suite for not much more, just a block away from Plaza Grande. It’s definitely more rough around the edges than the others, but is comfortable, well-staffed, and has a grand colonial ambiance that really makes it feel like you’re far from home. The highlight is a glassed-in courtyard in the middle that serves as the main restaurant. At night it’s romantic, in the daytime bright and cheerful. Downstairs is a bar with original stone walls that date back to the time of the conquistadors. Rooms could use some new furniture and fabrics, but are comfortable and have flat-screen TVs. See more at the official website, book online, or check a detailed review here. This hotel is more of a hike from the center, on the edge of the old city by Alameda Park. It moved from a location in a more modern part of town to take advantage of a stunning mansion from the turn of the 20th century. Its 15 rooms reflect the style of that time, with French embellishments that were all the rage then, set off by giant oil paintings and 4-poster beds with regal spreads. Despite all the opulence, rates are often less than at Patio Andaluz, making this one of the city’s best values. Full breakfast in the elegant restaurant is included. Rooms may look like they belong to French royalty, but they’re equipped with flat-screen TVs and complimentary Wi-Fi—plus a hot water bottle at the foot of the bed at turndown. See the hotel’s website for more info, book online, or check out this full review of Mansion del Angel. * Note that all Quito hotels levy a hefty 22% tax on top that’s often not listed in the rates you see online. On the plus side, very few hotels charge for Wi-Fi. Review and photos by editor and travel writer Tim Leffel. He was hosted by Casa Gangotena on his last visit to Quito, but was a visitor (and and anonymous diner) at the others. Get our weekly e-mail digest! Editor Tim Leffel has been reviewing hotels for more than two decades and has won dozens of "best travel writing" awards for his work. He is the author of five travel books including Travel Writing 2.0 (now in its 2nd edition) and A Better Life for Half the Price. See more at TimLeffel.com. Casa Gangotena is definitely on my wish list. It was still under construction last time I was in Quito. But what a great spot.